Do You Still Feel Guilt and Fear because You Fall Short of what God Demands? Recently I published a post titled God’s Love for Us Takes Away Our Fear, Guilt, and Self-Condemnation. Two responses represented what I am sure many people felt after reading the article—they still felt guilty and fearful. The post was not meant to fully explore the questions about guilt and fear; it was merely describing one aspect of the good news of Jesus. But I did not explain this. In hindsight, I should have done so and then mentioned that I would discuss how God’s love takes away our fear, guilt, and self-condemnation and how we can derive comfort and relief from our guilt and fear. I have now edited the ending of the earlier post to indicate that a fuller discussion will follow. This is that discussion on this very important issue, yet there is still more to say than can be said here, so I have included links within the text for further reading. If anyone wants to further explore some aspect or question, just let me know. Question: Jesus himself says, if we divorce and remarry without grounds of adultery, or death of a spouse we commit adultery????? That’s me! Thirty three years of a loyal happy second marriage, and the Anabaptists and Jesus tell me I’ve been living in adultery all these years, Guilt. Why did Jesus act as though his shed blood wouldn’t cover this situation???? Reply: I think Jesus was making the point that men who keep the law “Do not commit adultery’ and yet treat their wives harmfully by divorcing them for petty reasons (leaving their wives in very dire circumstances because in those days men had all the power and money)–those men were not faithfully observing the intent of the law against adultery. Jesus was telling people to abide by the spirit of the law and not the letter of the law. Response: Thanks, but I still feel guilty. This situation of misery and feeling of guiltiness rips my heart our, but it is far from uncommon. Many believers are taught that God judges us on how effectively we keep a long list of ‘God’s religious rules’ for us to follow. This is the very thing that Jesus taught against! His specific statement on divorce in Matthew 5 is one of a number of examples he gives on the contrast between keeping specific ‘laws’ and doing what’s right by internalizing the principle of the ‘laws’–to treat people right with their good in mind (loving people as we love ourselves). But if we abide by this statement as a specific codified ‘law’, then we have simply exchanged one rigid response for another one. The fact is, to protect people from serious harm—such as in an abusive relationship—divorce might be the best option. For more on divorce see How Does Loving Others as Yourself Apply to Divorce? Question: I want to agree, but why can’t I feel like I’m truly forgiven or like I’m not going to be ultimately punished or whatever in the end though? Reply: I understand your feeling. Perhaps we tend to have such feelings because it has been drilled into us for so long that God is angry, vindictive, and demands harsh justice. This is certainly what I was taught. It was not until I focused on the words and actions of Jesus, who represents the Father, that I began to understand otherwise. I hope you can do the same and overcome fear and guilt. Response: I’ve been trying to for years, JWB, but can’t get past it. Even in things like “repent” from Jesus’ own words and his mentioning hell even more than Heaven, I still can’t get past it for some reason. And perhaps I spent too long in the Southern Baptist and Roman Catholic Churches or something. This is another thing that grieves my heart—creating fear by teaching that God is angry with us and will punish us in burning hell forever. Neither premise is true. From their limited understanding, some Old Testament writers portray God as angry and vindictive, but Jesus does not; he represents God as the Father who loves us all and desires our peace and the healing of our fear and pain (see: God is not Angry and Harsh with Us as Many of Us Thought). Jesus does call on people to repent, but we have come to invest that term with misguided baggage. What does repent mean? It means to change course, or change our way of thinking. The context of Jesus’ message to repent was in response to the dawning of the Kingdom of God—or the establishment of God’s will on earth through a community of people devoted to the kingdom and kingdom ethics. To repent was to change one’s priority to the Kingdom of God rather than whatever priority they had before—even religious priorities. In identifying with the kingdom one should confess their sins (acknowledge their inadequate behavior patterns) and live in light of the expanding kingdom. The second premise—that God will punish us in burning hell is also false. The Bible does not teach such a thing. Much of the problem is that we have collected a number of passages that really do not relate to each other and infused them with a harmonizing concept that is not taught in the Bible. Even the words we translate as hell (Hades and Gehenna) don’t refer to an eternal burning hell. For a detailed examination of each passage using these words see my series collected in Resources on Hell and Conditional Immortality. There is no need to fear either that God will not forgive us or that we will burn in hell. If you wish to discuss, or ask questions about, beliefs that are troublesome to you, feel free to comment in the comment section below or, if you prefer, contact me directly at the email in Contact on the menu bar at the top of they page. Doesn’t God Require Something of Us? You might ask: This is all fine and good, but God must have some expectations of us. What is it that he requires? What commands must we follow? Ah!…there are expectations, but here there is even more Good News! And we will talk about it next time. 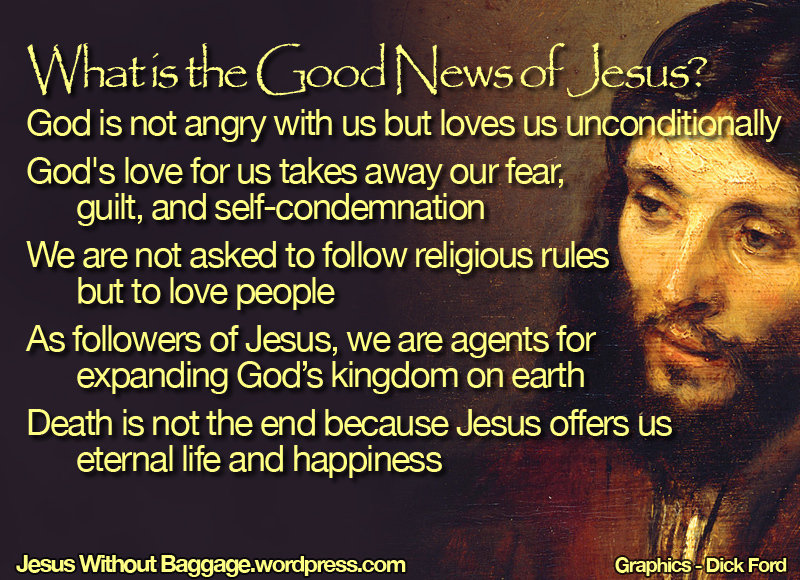 What is the Good News of Jesus Anyway? The purpose of this blog is to support those re-evaluating traditional religious beliefs. If you find the blog helpful, consider following to avoid missing future posts. In the column to the right, you can follow by email (most dependable), Facebook, or RSS. This entry was posted in fear, God, hell, Jesus, Kingdom of God, legalism, love, the Good News and tagged divorce, guilt, Matthew 5. Bookmark the permalink. 38 Responses to Do You Still Feel Guilt and Fear because You Fall Short of what God Demands? Guilt doesn’t belong in the vocabulary of a truly free Christian. Remorse, maybe, leading to ask forgiveness for a particular offence, but guilt? No. It was nailed to the Cross and should be left there where it belongs! You are so right, Tony! And I like your distinction between guilt (hurtful baggage) and remorse (a healthy and positive emotion leading to positive action). I had the unfortunate conversation with my godmother when I decided to leave the Catholic Church. Part of the reason centers around the denial of Holy Communion to a divorced and remarried Catholic. There is no remedy for that situation unless they can afford to go before a Tribunal and seek a declaration of nullity. If an annulment is denied, the person who divorced can’t receive our Lord until the first spouse dies. The remarried Catholic cannot even go to Confession. I find this scandalous. She was quite shocked and not really supportive or understanding. I cried all the way home from her house. Sheila, this is so sad! And it is all because of misguided teachings of the church–the Catholic Church in this case. But there are similar teachings in many protestant churches as well. My father, who was also my pastor, would not marry a couple if one of them was divorced. These views are usually held because of the way people read the Bible–as though it is filled with concise propositional truth statements from God–rather than reading the Bible according to the teaching and practice of Jesus to act in love toward all people and avoid doing them harm, which makes rigid ‘rules’ unnecessary. Another reason is that some Christian leaders continually hammer these ideas into our heads. I am sorry for your godmother, but it seems as though she is not ready to see things other than in her traditional understanding. Well it seems one more finger is pointing at those of us who feel guilt, as Christians. Quoting the above response, “Guilt doesn’t belong in the vocabulary of a truly free Christan.” It does no good to us what so ever to make us feel less of a Christian than we already feel we are. Wow, you must feel some kind of guilt to misunderstand what Tim said. I’m sure he means that guilt need not be in a Christian’s vocabulary. If you read this blog on a regular basis, Tim shares with us how the love of God for us wipes out our guilt. There is no finger pointing on this blog. We all struggle with guilt over things we’ve done, and sometimes it’s hard to remember just how vast God’s forgiveness is. Diane, I am sorry if that’s the way it came across. I think you mean that you feel guilty for feeling guilty, because that should not happen to a Christian….I think that’s what you meant. If that’s the case, then far be it from me to put even more guilt on you! What I meant is that there is no need to feel guilt; however, if you *do* feel it for whatever reason, maybe you need to tell the guilt where to go – because you do not need to own it. Grab hold of what Jesus did on the Cross. Don’t feel bad if your guilty feelings don’t go away instantly – they won’t! – but do decide to generate the habit of being guilt-free. You do not need to do anything, you don’t need to obey any rules, just accept what He has done already. I hope this is helpful! Tony and Sheila, well said for both of you! Well said. No I am not on this blog often. Thank you for clarification on your earlier comment. Thank you for the compassion. I do believe in Jesus’ shed blood on the cross for the forgivness of sins. But when I study the words of Jesus in the Gospels…well some of them scare me. Paul even quotes Jesus on the topic of adultery. How can I believe in His forgivness when I am living in what He says is adultery, by my own choice. I have been told I can’t expect forgiveness if I boldly go on living in sin as an adulteress. Jesus even said that if the innocent party remarried they are guilty. I just can’t reconcile any of it. Please help. Diane, I don’t know if you are a Catholic, but I left the Church over this issue. Of course God forgives us when we fail. That whole passage where Jesus talks about remarriage being akin to adultery is based on the still too common practice of merely putting away wives-kicking them out with no divorce. The ideal is a loving and committed lifelong marriage, but we are humans and sometimes we just can’t make it work. Believe that God loves you now, where you are. Show his love and forgiveness to others. That’s all he requires of us. Everything else was taken care of on the cross. No one can judge you for your current situation, certainly not other people. I’ll try. First up, let me start by saying that my underlying assumption is this: ‘God is Good – All the Time!’ I read the Bible through the lens of God being Good all the time. This means that whatever I read, I assume that God wants me to receive good from it. Love is the baseline for interpreting all of Scripture. Clear so far? A bit of background for Jesus’s statements about divorce. Moses permitted divorce but only if the man gave the woman a certificate of divorce, this allowed her to re-marry. That’s what it was for – it showed any prospective future husband that she was cleanly divorced and therefore free to re-marry. It showed that the reason why she was not a virgin – a really big deal in those days! – was because she’d previously had a husband but was now no longer bound to him. But by the time Jesus was asked His divorce question, men were able to divorce their wives for virtually no reason. What Jesus meant by calling remarriage ‘adultery’, was that He was condemning what you could call ‘serial monogamy’. A man could marry one woman, live with her for a time, and then when he got fed up with her for whatever reason, he could simply discard her by giving her a certificate, and then marry someone else. Presumably, he’d marry another girl and the same would happen to her in due course. Jesus was against this perfectly legal, but morally reprehensible, practice for obvious reasons. It created deep and irreparable hurt, it left a trail of broken women existing as sullied goods in, let’s not forget, a culture with no welfare state. And it was downright disgusting. That’s what Jesus was against here. The part about the innocent party being an adulterer/adulteress was simply Jesus using His Rabbinic hyperbole. He was exaggerating to prove a point. So, if you hate your brother, that’s like murder! Murder! No, of course it’s not; nobody dies. But He was proving a point by exaggerating. If you look at someone lustfully, that’s adultery! No, of course it’s not; nobody actually gets into bed with anyone else. But again it’s an exaggeration to prove a point. He’s saying you might as well get your ex to be an adulterer because that’s how much hurt it causes. Jesus’s statements were never intended to be legally-binding, ironclad rules that have to be followed come what may. Jesus wasn’t like that; he came to set people free from the rigid confines of the Law of Moses. “You have heard that it was said, ‘An eye for an eye; a tooth for a tooth’. But I say to you, love your enemies. He took the principles of the Moses law and made it into freedom of choice. And now, back to the original statement of God being Good all the time. Jesus’s words are not to destroy you, they are to bring you life in its fulness. And as you are already hurting, it’s worth remembering that ‘A bruised reed He shall not break….’ – Jesus will handle you gently, do not be afraid of Him. If you hear condemnatory whisperings in your head, that’s your conscience being oversensitive; it’s not God. Jesus looks after the orphans and widows – and in that you can include divorcees, even remarried ones! Can I suggest you look at more of Tim’s pages here on Jesus Without Baggage. There’s a lot of freedom on this blog! Learn how God sees you and in time the condemnatory feelings will fade away in the light of His love. Or it could even happen suddenly! Also, ask the Holy Spirit to reveal to you the truth of how God feels about you. You are precious in his sight! You will begin to feel different if you let Him work his way in you. Soak yourself in positive theology – ‘God likes you’ theology! – and listen to no-one who would seek to steal your joy. Who cares if they accuse you of cherry-picking ‘nice’ scriptures? At the moment you need all the encouragement you can get. Grab it with both hands and avoid all negativity, both from others and from Scripture – because it can be interpreted negatively! Sure, God did not intend divorce, but then He also did not intend poverty, unemployment, or sickness. It’s not His optimum, and He prefers things to be right, sure. But He also understands that sometimes despite our best efforts things go wrong. And when that happens, he does not condemn the victims; rather, He upholds them and draws near to them. Do not let your heart fee guilty, oppressed or any such thing. Life is for living. God wants you to enjoy your life free from guilt and depression and oppression. 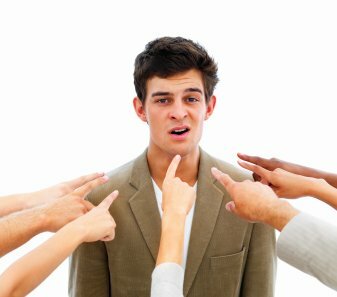 The Enemy destroys lives by using divorce and other catastrophic life events, then he destroys them even more by making people feel guilty about what he caused in the first place. This is plain wrong; it’s lies, and it deserves to be rejected. Live in the freedom! Sing out your freedom. Declare it and claim it; it’s yours. Such beauty there is in truth! Your words are so encouraging. Sheila and Tony, again both of you have given incredibly loving support to a hurting fellow believer. Thanks! Diane, there are only a couple additions I would like to make right now to what they have said. First, I firmly believe that Jesus’ entire foundation for the ethic he expects from his followers is to love other people with genuine concern for their goodwill and to avoid hurting people or causing harm as far as we are able. Let’s apply this to your re-married situation. If Jesus is opposed to divorce because it harms people and disrupts relationships, how can anyone tell you that Jesus requires you to divorce your current partner when we know definitely that doing so will cause the very hurt, harm, and disruption of relationships that Jesus opposes? Secondly I would say that nobody, and I mean not even a minister or pastor, has the authority to condemn another of God’s children–at all! I hope all this has been helpful, but I am quite sure it is not enough to take away your pain immediately or completely. Please continue sharing your thoughts and we will definitely respond as helpfully as we can. In a comment above, you said, “I have been told I can’t expect forgiveness if I boldly go on living in sin as an adulteress”. Well, as we have just seen, you have done nothing wrong; you are not an adulteress. So, yes, you should stop asking forgiveness, partly because there is nothing to be forgiven for, and partly because I wonder if that feeling of not being forgiven is due to what that person told you. In effect, that person has cursed you. Well, here’s the freedom: you don’t have to accept that curse. Reject it! So, yes, yes, yes! Give up asking – begging even. This will be part of your freedom. And give that curse no more room in your life. It sounds as if you have been subjected to what some call a ‘sin-management church’. A church who focus on rooting out and dealing with sin in its members. Surely their focus is wrong; Jesus dealt with sin once and for all on the Cross. He came to free us from not only the separation from God, but also the entangling effect of the guilt. Please look at this blog post where I have written out one of my sermons, on just this exact topic: http://www.flyinginthespirit.cuttys.net/2015/03/11/freedom-and-purity/ It will help you with some practical tips on how to leave your sin behind with a clear conscience. That’s another thing: your conscience needs to be brought into line. It’s your adviser, but it’s not your king. You can listen to it, you can give it consideration, but you don’t need to let it bully you, especially when it has been ‘trained’ by people who are harsh and bullying. Make Jesus the King of your conscience. Let Jesus transform your conscience by retraining you in His truth and freedom. Shed the burden that the Pharisees have heaped upon you; Jesus took that burden at the Cross. One last thing: a parable, although a true story. This morning, there was a moth on the inside of my kitchen window, wanting to get outside into the beautiful morning light out there. I opened the window right out (it swings really wide) and yet still the moth clung to the inside of the glass, even though that glass was now ‘outside’ the room. Not until I gave it a gentle prod with my fingernail did it fly out into freedom. Diane, the window is open for you. Fly out into your freedom. I cannot tell you what you should do, but I would suggest that you not ask forgiveness for your ‘adultery’ any more. If you felt that you needed to ask forgiveness, and did so, then it is over. If you were asking forgiveness of God, then he forgave you the first time, and continued asking might indicate your uncertainty of God’s forgiveness. If you were asking forgiveness of your former partner, then that is all that you can do; if he does not seem to grant forgiveness, then holding that resentment will eat at him–you no longer have to carry any burden of his un-forgiveness. One cannot be controlled by the judgment of others. I like Tony’s earlier distinction between guilt and remorse. I have hurt people in the past, and I would go back and change my responses if I could–but I can’t. After I have done all I can, apologizing and making amends if possible, I no longer carry the guilt. But I do feel remorse: I wish it had never happened, I wish things had gone differently, I resolve to change that part of myself so that it doesn’t occur again. I will always have sadness for what I did–remorse but not guilt. I agree with you that Jesus, and the Father, are likely very happy with your current, positive, and blessed marriage. Thank you so much JWB and Tonycutty. I am reading the blogs suggested and all your kind advice has really helped. The begging for forgivness has ended. Guilt not on my mind. Freedom opening up before me. God bless you guys. Diane, I am really happy for you. You might want to read a book that Tim, the host of this blog, recommended: “Love Wins” by Rob Bell. It turned my whole vision of forgiveness around. The reality of what God did on the cross through Jesus is astounding. Understanding just how much God loves you will bring you peace. I am doing what I can to bring attention to the plight of remarried people in the church. We humans cannot always be perfect, and we can have remorse over some things we did or said, but God’s forgiveness is instantaneous. We need other Christians to see others in this light, instead of judging them. I pray for your peace. Diane that’s great news 🙂 Live in the blessedness! Apparently we can also access the book online via that link. Good post and though I’ve not been divorced, I’ve struggled with personal issues in the same way. It helps me to know that I wasn’t chosen in Christ because I’m perfect or will ever be able to be perfect. I was chosen as a vessel of God’s mercy because I was and sometimes, still am such a mess that only God can get the glory for the spiritual fruit He has developed in me. Adam and Eve wanted to be God, they wanted to do so by their own power, and religion reflects that same wrong-headed desire. None of us can be God. We are human beings, designed to mirror God, in the same way that children mirror their parents. He is our loving Father and we are lost without Him. Thanks for the contribution Pam. I really agree strongly with your statement, ‘He is our loving Father and we are lost without Him.’ This is so important to me. I had so much of this guilt, shame, and fear, for so many years: I have truly been set free by the love of God. God challenged me to remember my most sinful and shameful moments of my life- and He said- do you believe I loved you in those moments? Then I remembered the most noble deeds of my life- and He said- Do you believe I loved you in those moments? Then He asked me- Do you believe I love you? Then, God revealed to me that His love is perfect and unwavering. He did not love me less when I was bad or more when I was good. He loves me. I believe that if I am to love God, I must deeply love, forgive, be patient, and kind to myself. For God is truly within me. We are the temple of God! You are forgiven by Jesus: now forgive yourself, be kind to yourself, be loving to yourself. For me- practically speaking- When I feel shame about a moment in my past: I lovingly remind myself that God loves me, and I forgive me. You are forgiven, You are God’s beloved!!! !, You are the one that Jesus loves!!!! Now you must forgive and love yourself. “Come unto me those who are thirsty and heavy laden, and I will give you rest”. J.B., thank you for sharing this wonderful encouragement!